We are pleased to announce that Professor Sumio Iijima (Meijo University, Nagoya University, NEC and AIST, Japan) has won the 2015 Diamond and Carbon Materials Award for his exceptional achievements in carbon nanoscience, in particular for his seminal work on carbon nanotubes. The award is to recognise pioneering research in the field of diamond and carbon materials. 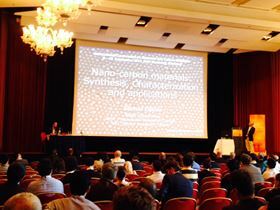 This award was presented to Professor Iijima at the International Conference on Diamond and Carbon Materials 2015 – the 26th edition of the conference series - where he also gave a plenary lecture. For work exploring boron doped diamond as a pH and chlorine sensor for water safety.